In today's world of modern conveniences, everything we rely on is run by electricity. But what happens if the power we take for granted turns against us? Old man Holger (Charles Tyner) knows. He claims electricity is a living presence, whose voice can only be silenced by getting rid of anything that can hear it. Bill Rockland (Cliff De Young), however, refuses to believe him. It must have been an accident when an electric spark ruptured the gas pipe that nearly killed Bill's son (Joey Lawrence). And it's surely a coincidence when Bill's wife (Roxanne Hart) is severely scalded by their electric water heater. But when his own power tools attack him and an electrical fire turns their home into a blazing inferno, Bill realizes Holger may have been right after all, and perhaps the time has come to finally pull the plug. This is another one I never seen before... but it was cheap and sounded interesting so I decided to take a chance on it. Unfortunately this one is not all that impressive. I mean it has it's moments...but they are few and far between. The movie is slow and I just couldn't get myself to care about the characters. Then there is the fact that the acting itself leaves some to be desired at times. The dvd itself is ok at best as well. The audio and video is fine though some grain in the video... as for extras all you get is a selection of trailers. This is not a DVD I see myself watching much... if I decide to watch it again. One night, as high school sweethearts Eric Matthews ('Derek Rydall') and Melody Austin ('Kari Whitman') dance in Eric's bedroom to their special song, a raging inferno sweeps the house. Eric shoves Melody through a broken window, but he becomes trapped by a tumbling bookcase. As the fire engulfs Eric, someone douses Melody, who's now lying on the ground, with gasoline. All she can see is a St. Christopher's medal dangling from the arsonist's ear as he opens a book of matches, and she loses consciousness. One year later, a shopping mall stands on the site of Eric's burned house. No one believed Melody's story, and the fire was forgotten as soon as the Matthews were buried. But the past isn't quite ready to let go of Melody. At the mall where she works with her friends Susie ('Kimer Sissons') and Buzz ('Pauly Shore'), haunting reminders of Eric appear inexplicably, and more ominous events unfold without her knowledge. A security guard vanishes, the mall manager's son has a fatal date with an escalator, and suddenly, a new security guard with a medal earring patrols the mall. Then, one evening, Melody is attacked in the mall parking lot by a man in a black ski mask. Like an avenging angel, a shadowy figure wounds her assailant then disappears as Mayor Karen Wilton ('Morgan Fairchild') speeds her car across the garage to Melody, and the wounded man escapes. Another Blind Buy that I picked up because it was cheap and sounded like it could be good. At the same time from the title alone you can easily expect a low-budget piece of trash. So I went into this one with low expectations. In this case I was pleasantly surprised... even though it is not the best movie I ever seen... this is an enjoyable movie. It has good characters and some interesting kills. It was definitely better then I was expecting. Unfortunately this dvd has no extras what so ever to go with the movie. But at least with this one I got a movie I can enjoy. Another one I have never seen. I am going into this movie with low expectations as I have heard this is the worse of the sequels. And maybe that helped me... I don't know... but I did enjoy this film. Just not as much as the first 2. It seems this one lost some of the suspense that made the first 2 films so good. This does make me worry about the final movie in the set. Especially considering the next one is a TV Movie that originally aired on Showtime. In this chilling prequel to the classic Hitchcock thriller, Norman Bates ('Anthony Perkins') is drawn to a late night radio show, where the host ('C.C.H. Pounder') encourages him to share his views on the topic of matricide - the murder of a mother by her own child. Reliving his childhood, Norman recounts his trials as a young boy ('Henry Thomas') living with his widowed schizophrenic mother ('Olivia Hussey'). These haunting memories are more than just images of the past; they threaten to rekindle his killing urge in this spine-chilling thriller. As I said above... I was a little worried going into this one what with the last not not being as good as the first two and this one being a TV Movie. I did like the idea of a prequel though. Luckily I did enjoy this one more then part 3. I liked how they did the movie with flash backs and Anthony Perkins telling his story on a radio talk show. I thought the kid that played a young Norman Bates did a real good job. Unfortunately unlike the other 2 movies in this set we didn't even get the trailer for an extra. But over-all the set was pretty cheap and the movies was ranged from good to very good. So I am happy I added this set to my collection! The cousins and Jack must track an antique quill pen that grants wishes in exchange for somebody's life. The search leads them to a monastery that is famed for its eerily accurate prophacies. This was a good episode... though not quite as good as the pilot of the series. I thought it was stretching it a bit to have Robey's character dress as a boy to get into the monastery. Just looking at her face even in the monk robe with hood on you can see she is a woman. So that part bugged me a little. Another movie I have never seen before today. I got this movie years ago in a free classic movie boxset (40 movies on 20 DVDs) that I got free for subscribing to Total Movie magazine. So going in I wasn't expecting much at all quality wise. Bit in the case of this movie I was fairly impressed how it looked... at least on my cheap 20in TV. The movie itself was entertaining. Definitely a good movie... but I have seen better. While traveling to New York, the young couple Madeleine Short Parker (Madge Bellamy) and her fiancé Neil Parker (John Harron) are convinced by their new acquaintance Charles Beaumont (Robert Frazer) to stay in Port Prince and get married in his mansion. However, Beaumont fell in love for Madeleine and his real intention is to convince her to call off the wedding. When he realizes that the time is too short to seduce her, he visits the local witch Legendre (Bela Lugosi) , who gives him a drug to transform Madeleine into a zombie. She dies immediately after the wedding, and her corpse is disputed by Beaumont and his sick love for her; Legendre, that wants her for his team of zombies; and Neil, who is convinced by the local missionary Dr. Bruner (Joseph Cawthorn) that she might be alive. Another movie I have never seen before today. I got this movie in that same free classic movie boxset as I did with Dementia 13. This time however... the image quality is not nearly as good. And the audio has a constant hissing throughout the movie. Even though I was able to watch the movie. It didn't impress me too much. Maybe I am just too used to the Romero "zombies", this type of zombie (basically people in a daze being used as slaves with no self control/will) just didn't do it for me. I may be spoiled by what we consider Zombies now... but this movie (I am sorry to say) basically just bored me more then anything else. Not to mention that the quality of this disc took away from my enjoyment of the movie as well. Maybe I am just too used to the Romero "zombies", this type of zombie (basically people in a daze being used as slaves with no self control/will) just didn't do it for me. I may be spoiled by what we consider Zombies now... but this movie (I am sorry to say) basically just bored me more then anything else. Hey Pete, if you ever get chance I'd be interested to hear what you think of I Walked With A Zombie which I reviewed in my Val Lewton thread. It's definitely the traditional slave voodoo zombie style and there are only two such characters, but I found them very effective. That said, what they did and why wasn't really the focus of the film, so maybe if it was supposed to be a full-on zombie flick I'd have been disappointed. It's worth noting the movies in that set are decent quality though. I don't have it in my collection... but I would be willing to put it on my list to get.... I would give this style of zombie another try... but would have to get the movie fairly cheap. and yeah... I definitely think the quality of that disc did effect my enjoyment to a point. In the wilderness of the Pacific Northwest, four top soldiers in the Army Special Forces disappear on a routine training mission. 'Michael Rooker' and 'Casper Van Dien' lead a crew of eight top-notch soldiers to track down the inexplicable demise of their comrades. Though the soldiers have no idea what they are looking for, their search leads them to an old, blind Indian who tells them the tale of Cotton Mouth Joe -- the bravest and most ferocious warrior in an Indian tribe that, four hundred years previously, slaughtered his entire tribe in a fit of rage. Only one young girl was spared -- the Morningstar. According to legend, she alone has the power to send Cotton Mouth to his mortal grave. The soldiers believe the old Indian is crazy and that the story is nothing more than a myth...until the terrifying spirit of Cotton Mouth ominously materializes upon a black stallion, wielding a lethal spear. 'The Skeleton Man' has returned from the depths of hell to rain death and destruction upon any mortal who dares cross his path...this time it is the soldiers who are locked dead in his sights. I bought this movie never seeing it before. I mainly got it because it was really cheap and sounded like it could be good. Going into it I figured it would definitely be low budget... but I have seen good low budget movies before. Unfortunately I didn't see a good one this time. I mean it did have it's moments... and a few half way decent effects... but at the same time some bad effects and a mixture of stupid and boring storyline. 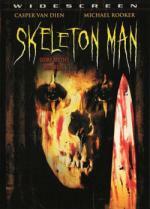 The look of "Skeleton Man" was basically a man in a (fairly cheap looking) skeleton mask... even though he was not meant to be. Was supposed to be a curse come to life. Not very impressive at all. That's not a bad price at all for 2 movies. I will be sure to put it into my wishlist. Yeah, that wouldn't be bad for two films. My "blind buy" limit is usually around £7, so I would have taken a punt. They aren't available in R2, so I decided to get the boxset which was about $35 (£17) in one go, knowing it could fetch more than that on Ebay if I decided they were crap. Not so far though! Love knows no bounds when an unappealing slob gets hold of an ancient cupid statue that has women falling down dead at his feet. This episode I never seen before. But that is not surprising as I only caught episodes here and there when they aired on TV. this was definitely a good episode. I think it is right up there with the pilot. As they said in the episode... that cupid statue was one ugly looking thing. One sip from a haunted tea cup lets the user take youth and talent from an unfortunate victim. But will one senior citizen take her thirst for fame too far?